Happy birthday, Grandma. We miss you. 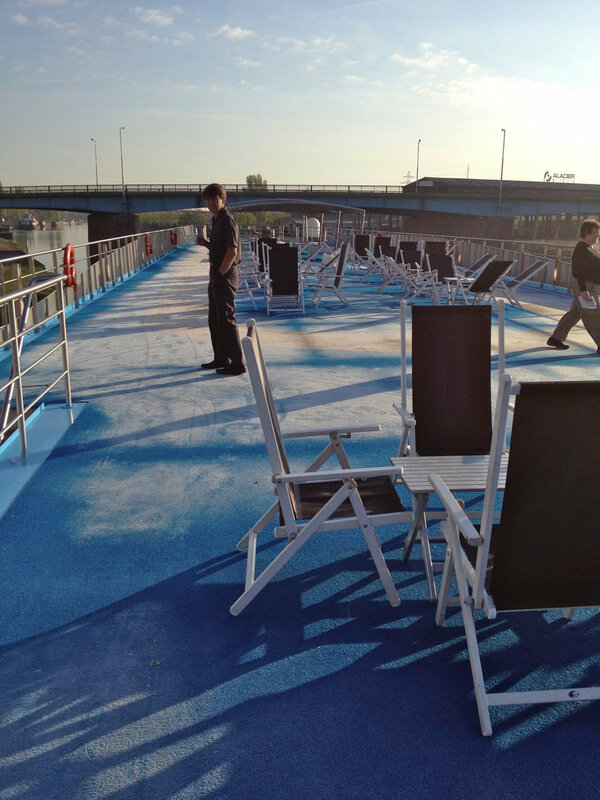 This morning we docked around the 6 am hour in Mannheim. We breakfasted early, picked up our boarding cards, and got ready for the trip to Heidelberg, one of my old stomping grounds. We were headed to the center of the old city for sight seeing and shopping. The air was bitterly cold, and I was extremely glad for the hat I had in my pocket, thank you Maria! Our tour guide was French, and he made interesting and fun conversation about the history of Heidelberg, particularly from a French slant. Loved it! Heidelberg is The fifth-largest city in the state of Baden Wurrtemberg, Heidelberg is part of the Rhine-Neckar metropolitan region, with over 145,000 people in the city. It is bordered by the Neckar river in Odenwald (Oden forest). Heidelberg is the location of the well known Unviersity of Heidelberg, with many students coming from outside the city, as well as the country. The city is dominated by the ruins of its extensive castle, and is filled with Baroque architecture, which is visually very pleasing, and as mentioned before, is renowned for for its state university, the oldest in Germany. Originally free to Germans and foreign students, there is now a cost of approximately 500 Euros per semester. This includes graduate and medical students! The university ws founded in 1386, and was the fourth university established in the Holy Roman Empire -- and it’s been co-ed since 1899! The castle is a mix of styles from Gothic to Renaissance. Prince Elector Ruprecht III erected the first building in the inner courtyard as a royal residence. The building was divided into a ground floor made of stone and framework upper levels. Another royal building is located opposite the Ruprecht Building: the Fountain Hall. Prince Elector Philipp is said to have arranged the transfer of the hall's columns from a decayed palace of Charlemagne from Ingelheim to Heidelberg. In the 16th and 17th centuries, the Prince Electors added two palace buildings and turned the fortress into a castle. The two dominant buildings at the eastern and northern side of the courtyard were erected during the rule of Ottheinrich and Friedrich IV. Under Friedrich V, the main building of the west side was erected, the so called "English Building". The castle and its garden were destroyed several times during the 30 Years’ War and the Palatine War of Succession. As Prince Elector Karl Theodor tried to restore the castle, lightning struck in 1764, and ended all attempts at rebuilding. 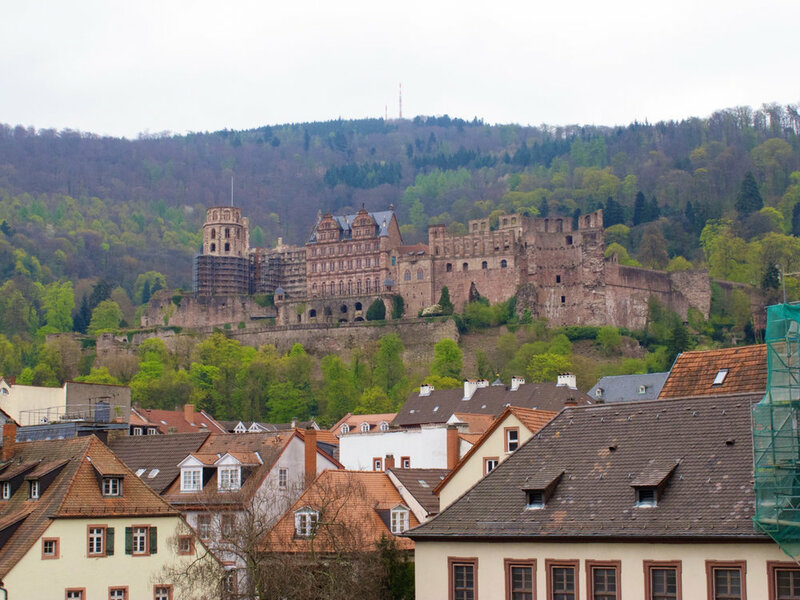 Later on, the castle was misused as a quarry; castle stones were taken to build new houses in Heidelberg. 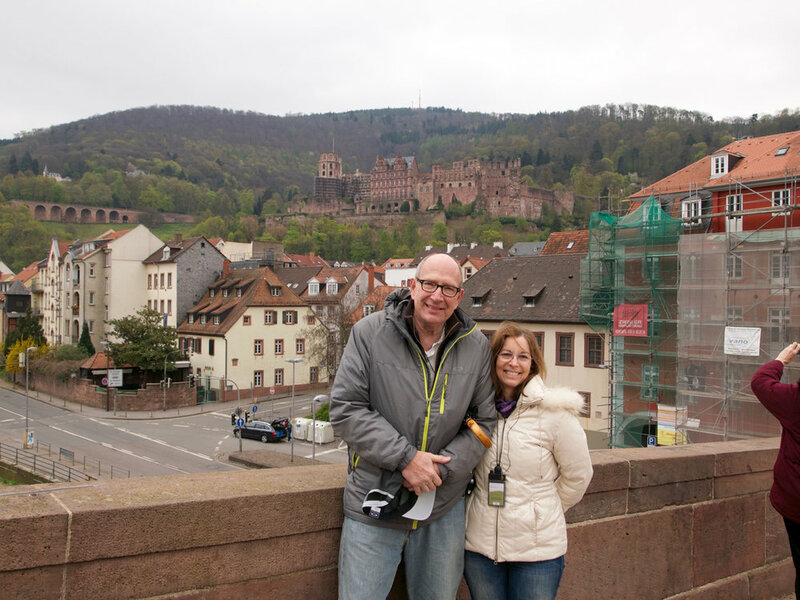 This was stopped in 1800 by Count Charles de Graimberg, who then began the preservation of the Heidelberg Castle. There’s a new visitor’s center (new since my last trip here in 1999) at the entry to the castle, and you can no longer go down into the main courtyard to see the wells and the cannons, but it was still beautiful. The weather was bitterly cold, so I was extremely grateful for the hat Maria had made during our time in San Diego in January. It has been used several times! We made our way through the main square in the castle, and then went down into the wine storage cellar, where we got to see the enormous wine cask. 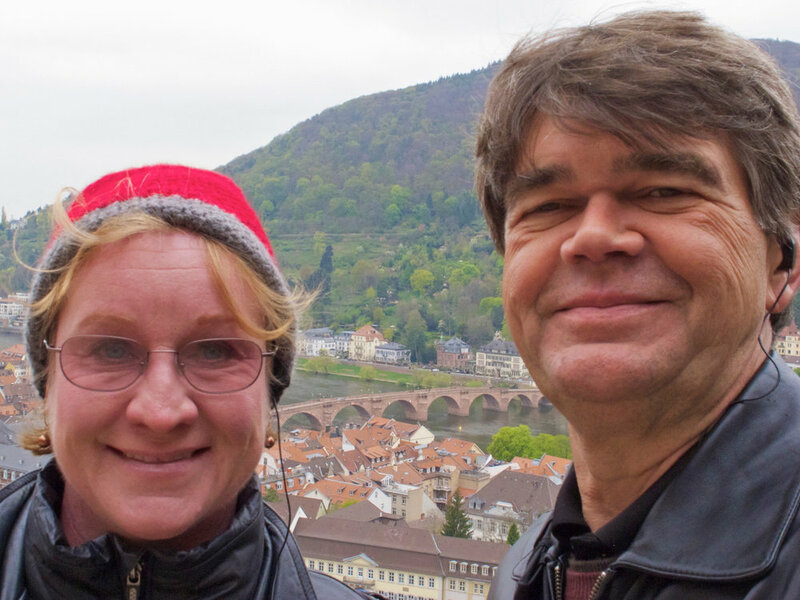 We went on the Hauptstrasse after taking a walk on the Alte Brucke, the old bridge. 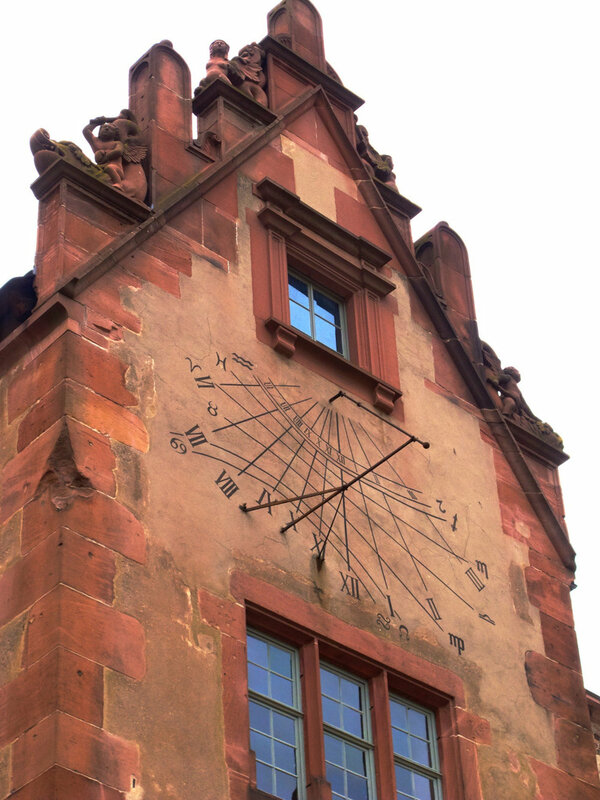 It is the oldest entryway across the Neckar River into Heidelberg, and is marked with the flood levels dating back hundreds and hundreds of years. An amazing piece of architecture, I remember being there watching a reenactment of the burning of the Neckar River during the 30 years’ war back when I was a baby lieutenant. This is one of the longest shopping streets in all of Germany, and is a pedestrian only area (in theory, in practice, they have to get goods to the shop somehow...). It is over 1K in length, and is filled with little shops and cafes. It was a nice stroll, and I managed to get distracted by a shop or two before our hour was up and we had to go back to the buses. My first purchase, conducted entirely in German, was for a pair of gloves (Handschuhe). I think that from now on, the Maria hat and the Heidelberg gloves will remain a matched set. The afternoon was Mac classes on iWork, iPhoto, and iMovie, followed by a class on how to speed up your Mac, which Wayne and I already do very well! Well, we did all of those things very well, but the new iPad functionality of iPhoto is nice. Tomorrow we spend the entire day in Strasbourg, and Wayne gets to use his French. We are thinking of getting bicycles from the ship and tooling around in the afternoon during our free time.